I recently moved from Pocket to Instapaper and was welcomed by a brand-new design on beta. I also wanted an excuse to use IFTTT and decided to check what it had waiting for Instapaper. Only one action and no triggers? Let's see what we can do with that. I'll try to avoid obvious recipes, like IF "New article saved for later" on "Feedly" THEN "Read later" on "Instapaper". The first trick is sending an url from within a starred post at App.net straight to Instapaper. This recipe picks the first link from the content of the post and uses it as a variable. Just to be clear, it is not the post that goes to Instapaper, neither the content, it is the link within the content. If you star a post without a link, you'll get an IFTTT post telling you it didn't work on Instapaper. It's a bummer, but not such a big deal. The real magic happens when you stop using the Instapaper channel. Wait, how come? What about we do the other way around and send liked articles to App.net? Every account has its own RSS feed for every different section of Instapaper: unread, liked and archive. In the recipe, replace the feed url (https://onetapless.com/feed) for your liked articles' feed. You can grab this link in the bottom right of your screen, as the next image shows. The coolest thing about this recipe instead of the automatic option offered by Instapaper is that you can customize how your post will look like. I've been having issues authenticating App.net, so this recipe makes it up for me. The archive also has a RSS feed, so you can send your archived articles straight to Evernote. Same drill as the previous recipe, change the feed url for the archive's feed which can be found at the exact same spot. You can tweak the recipe and use the "New feed item matches" trigger to pick a different notebook according to a keyword or phrase from the article. The "New feed item matches" also goes the other way around, sending links to Instapaper. For example, you're interested by the articles from a news site concerning a specific subject, however, you couldn't care less about everything else published daily. 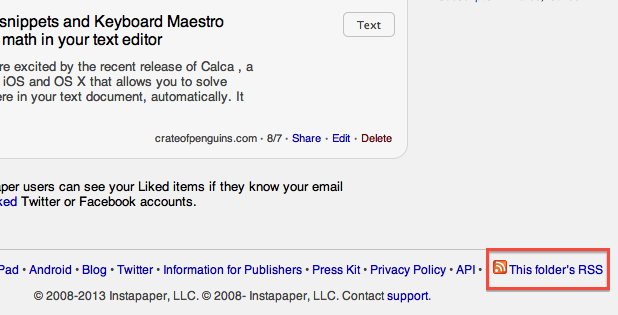 Set a keyword and direct articles containing it to Instapaper. Boom, better than subscribing to a useless RSS feed. Instapaper has been around for ages, so you can expect to find great resources to improve your experience on the web. If you use Fever, as I do, you can follow this superb tip by Dan Lowe to make sending articles effortless. And for the love of your mother, don't miss Brett Terpstra essential Safari extension Instapaper Beyond.